This CD-ROM is sub-titled 'Over 1,000 picures from my private collection' which is a very accurate description of its contents. The disk contains the JPG images of the pictures organised in directories by genus with the file names being used for the full plant name. There is no accompanying text description or information. There is a free windows slide show viewer (iview298) on the disk but users may wish to use use one which they already have installed rather than install another different one. 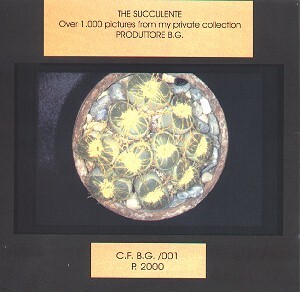 The disk does include both cacti and succulents which may not be self evident from the disk title. I did not look at the entire contents of the disk but my impression was that that there are some nice pictures but rather a lot of comparitively immature plants which may not be ideal for identification which is probably one of the purposes of such disks as this one. I did notice one or two mis-identifications although by and large the plants seem accurately named. Available from Francesco Cicala (e-mail: cicala12@interfree.it. The price, 30 US$ is low which makes it a reasonable buy considering it is simply a disk of pictures.